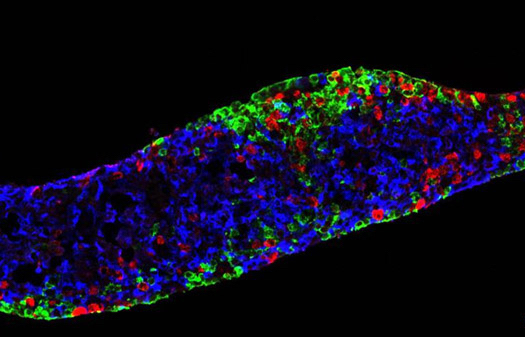 ViaCyte’s attempts to develop a stem cell therapy for diabetes have been stymied by the immune system, which recognizes the implanted cells as foreign. Meanwhile, CRISPR Therapeutics has found success in gene-editing cells so that the cells avoid such immune responses. Now the two companies are combining their respective technologies to develop a stem cell-based therapy that could effectively cure type 1 diabetes. According to the agreement announced Monday, CRISPR (NASDAQ: CRSP) is set to pay San Diego-based ViaCyte $15 million in either cash or CRISPR stock. CRISPR has an additional option to pay $10 million more in the form of a convertible promissory note. Requirements for the additional payment were not specified. ViaCyte has been trying to develop a type 1 diabetes treatment, using implanted stem cells engineered to grow into insulin-producing pancreatic cells, which would hopefully eliminate the need for daily insulin injections. These stem cells are delivered by implanting a membrane-bound device containing the cells. Clinical trials testing this therapy, called PEC-Direct, started last year. The membrane allows blood vessels to grow through the device and reach the cells. ViaCyte says that while this approach could offer a long-lasting benefit, the immune system will still see the implanted stem cells as foreign and reject them. That means patients receiving this treatment will require long-term immunosuppression drugs. For that reason, ViaCyte has developed PEC-Direct for type 1 diabetes patients who face a high risk of complications. ViaCyte wants to develop a version of its treatment that doesn’t require immune suppression and says that gene editing technology could protect transplanted stem cells from the immune system. CRISPR has already pursued a similar approach in its cancer cell therapy research. The Switzerland-based company, which has U.S. operations in Cambridge, MA, has three experimental “off-the-shelf” CAR-T treatments made by using its gene-editing technology to engineer donor T cells. The collaboration calls for CRISPR and ViaCyte to work together to develop a stem cell line that can avoid attack from the immune system. If this research leads to a therapeutic candidate, the companies will share the responsibility for further development, and if approved, commercialization.